The other day I came into my room after work, sat down in front of my computer to check my email, as I suddenly felt something tickling my forearm. I looked down and saw a tiny ant crawling up my arm. Not thinking much about it I continued to check my email and then went out with my roommates to catch a movie (Transsiberian, which was excellent by the way :)). We came back at around midnight, and I again sat down to check my email. For some reason, I didn’t turn on the light in my little office room. So only the computer screen was illuminating the room. After a while, I felt this strange tickling sensation again. But this time it wasn’t just on my forearm. It was all over my body. As I looked down I saw all sorts of movement, on my arms, on my legs, everywhere. I turned on the light and was shocked to find that my entire room had been infested with an army of ants. They came in through a little slit in front of the balcony door and formed a street straight to my garbage bin where they had found the remains of a tangerine I had eaten that day. Not having any ant spray at home I walked down to the kitchen to get the next best thing, a cleaner called Green Works. “Natural, all-purpose cleaner” it said on it. Yeah, right. Natural. When I sprayed the ants with that thing they immediately dropped dead. So I sprayed and sprayed, and wiped them all off the floor, the desk, the chair, the garbage bin, and not to forget myself, filling an entire garbage bag with paper towels full of dead ants. After about half an hour the battle was over. I was victorious. Or so I thought. Turns out that the Green Works cleaner worked well as an instant ant killer, but not so well when it came to keeping them from coming through that slit again from the outside. So even the next day I still had some ants in my room. Once I got around to buying some proper ant spray their days in my room were numbered as well. Anyway, the moral of the story is: I really hate ants ;). I had an ant infestation at every house I’ve lived in here in the US so far. Of course, I could have been smart and not ignore the first warnings. 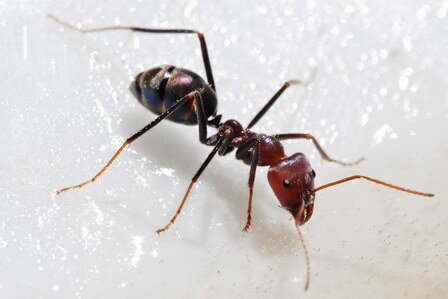 Whenever you see one ant, one itsy-bitsy, tiny, little ant, in your room, it means it’s all over. You see, these first few ants are the scouts. They’re searching for routes to get food. And once they find something, and it could be something insignificant for a human, such as some breadcrumbs on the floor or – ahem – tangerine remains in a garbage bin ;), they will notify all their ant friends – thousands of them. So the next time you see one little ant do yourself a favor and get some ant spray and spray it in front of doors and windows. I know I will. I seriously just had an ant crawling on my desk twenty minutes before reading this. I don’t see any food around so I think I’m safe. If I’m not at work tomorrow call an ambulance. we had ants at a house in australia and mom put down borax (or laundry detergent) across the access point. they get disoriented as they are guided by smell.